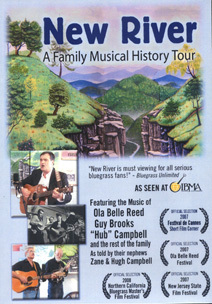 New River: A Family Musical History Tour is a musical documentary of the Campbell and Brooks families, both of whom have roots in the rich musical culture of the North Carolina mountains. Brothers Hugh and Zane Campbell, with fellow musician Gary Irving, narrate and play some of their own and their family’s songs. Hugh and Zane also have achieved their own musical success. Hugh’s song “Shape of a Tear” was nominated for 2003 Song of the Year by the International Bluegrass Music Association. Zane’s “Post-Mortem Bar” was in the film, Longtime Companion, which was the first American film about HIV/AIDS. Zane’s music was also the soundtrack for Bittercress, which has been in several film festivals (including the 2007 Cannes Film Festival Short Film Program) and on cable television. New River was an official entry in the 2007 Festival de Cannes Short Film Program.